Dennis Novikov of San Jose jumped 44 places to a career-high No. 243 in doubles this week. The 21-year-old former UCLA star reached the final of the $50,000 Savannah Challenger on clay last week with Julio Peralta of Chile. Novikov dropped two spots in singles from his career high of No. 190. Matt Seeberger, 30, of Los Altos is close behind Novikov in doubles. Seeberger rose 36 notches to a career-high No. 261 by advancing to the quarterfinals of the $100,000 Guadalajara Challenger on hardcourts with Jason Jung of Torrance in the Los Angeles area. Collin Altamirano, 19-year-old Sacramentan -- No. 883 in singles (no change). Bradley Klahn, 24-year-old former Stanford star -- No. 230 in singles (-1), No. 151 in doubles (-3). Scott Lipsky, 33-year-old former Stanford star -- No. 33 in doubles (+1), unranked in singles. Mackenzie McDonald, 20-year-old Piedmont resident -- No. 535 in singles (+1), No. 560 in doubles (-1). Dennis Novikov, 21-year-old San Jose resident -- No. 192 in singles (-2), career-high No. 243 in doubles (+44). Aisam-ul-Haq Qureshi, 35-year-old member of Sacramento-based California Dream in World Team Tennis (2015) -- No. 48 in doubles (+2). Sam Querrey, 27-year-old San Francisco native and former Sacramento Capital in World TeamTennis (2012-13) -- No. 38 in singles (no change), No. 59 in doubles (+1). Tennys Sandgren, 23-year-old member of California Dream -- No. 259 in doubles (+10), No. 449 in singles (+14). Matt Seeberger, 30-year-old Los Altos resident -- Career-high No. 261 in doubles (+36). Dmitry Tursunov, 32-year-old resident of Folsom in Sacramento area -- No. 201 in singles (-4), No. 325 in doubles (-2). Kristie Ahn, 22-year-old former Stanford star -- No. 525 in singles (+2), No. 603 in doubles (+2). CiCi Bellis, 16-year-old resident of Atherton in San Francisco Bay Area -- No. 173 in singles (no change). Alexandra Facey, 22-year-old resident of Cameron Park in Sacramento area -- No. 727 in doubles (no change). Kat Facey, 22-year-old resident of Cameron Park in Sacramento area -- No. 727 in doubles (no change). Jarmila Gajdosova, 28-year-old member of California Dream (2015) -- No. 49 in singles (no change), No. 54 in doubles (no change). Anabel Medina Garrigues, 32-year-old member of California Dream (2015) -- No. 35 (-1) in doubles, No. 519 (+7) in singles. Nicole Gibbs, 22-year-old former Stanford star -- No. 94 in singles (+2), No. 991 in doubles (-1). Michaela Gordon, 15-year-old resident of Saratoga in San Francisco Bay Area -- No. 712 in singles (+37). Lejla Hodzic, 29-year-old former Stanford standout -- No. 752 in doubles (-1). Raquel Kops-Jones, 32-year-old San Jose resident and former Cal star -- No. 14 in doubles (-1), No. 790 in singles (+4). Maria Sanchez, 25-year-old Modesto product -- No. 104 in doubles (+2), No. 184 in singles (-1). Allie Will, 24-year-old native of San Mateo in San Francisco Bay Area -- No. 214 in doubles (+3), No. 576 in singles (-1). Carol Zhao, 19-year-old Stanford sophomore -- No. 287 in singles (+3), No. 501 in doubles (+4). Estoril (men), quarterfinals, 1-5 p.m. (delay). Munich (men), quarterfinals, 5-9 p.m. (delay). Munich (men), semifinals, 11 a.m.-1 p.m. (delay), 5-9 p.m. (repeat). Estoril (men), semifinals, 3-5 p.m. (delay). Estoril (men), final, 3-5 p.m. (delay). Madrid (men), early rounds, 5-7 p.m. (delay). Munich (men), final, 7-9 p.m. (delay). May 8-9 -- NCAA Division I Men's and Women's Team Championships, first and second rounds at various sites. June 6-7, June 13-16 -- NorCal Boys 18 and 16 Junior Sectional Championships, Rio Del Oro Racquet Club, Sacramento. http://tennislink.usta.com/tournaments/TournamentHome/Tournament.aspx?T=159357. June 6-7, June 13-16 -- NorCal Girls 18 and 16 Junior Sectional Championships, Arden Hills Country Club & Spa, Sacramento. http://tennislink.usta.com/tournaments/TournamentHome/Tournament.aspx?T=159675. June 6-7, June 13-16 -- NorCal 12s Junior Sectional Championships, Sunnyvale Tennis Center. http://tennislink.usta.com/tournaments/TournamentHome/Tournament.aspx?T=159001. June 6-7, June 13-16 -- NorCal 14s Junior Sectional Championships, Fremont Tennis Center, http://tennislink.usta.com/tournaments/TournamentHome/Tournament.aspx?T=159040. JUNE 29-JULY 12 -- WIMBLEDON. 2014 champions: Novak Djokovic, Petra Kvitova, Vasek Pospisil/Jack Sock, Sara Errani/Roberta Vinci, Nenad Zimonjic/Samantha Stosur. www.wimbledon.org. July 12 -- Sacramento-based California Dream's inaugural World TeamTennis match, at San Diego. www.californiadreamtennis.com. July 13 -- California Dream's inaugural home match, vs. Springfield, Sunrise Mall in Citrus Heights, 7:30 p.m., www.californiadreamtennis.com. July 13-19 -- $50,000 Stockton Women's Challenger. July 21-26 -- $50,000 Gold River Women's Challenger, Gold River Racquet Club in Sacramento area. Qualifying begins July 19. Champions in 2014: Olivia Rogowska, Daria Gavrilova/Storm Sanders. www.goldriverchallenger.com. July 14 -- California Dream vs. Philadelphia, Sunrise Mall in Citrus Heights, 7:30 p.m., www.californiadreamtennis.com. July 17 -- California Dream vs. Austin, Sunrise Mall in Citrus Heights, 7:30 p.m., www.californiadreamtennis.com. July 18 -- California Dream vs. Boston, Sunrise Mall in Citrus Heights, 7:30 p.m., www.californiadreamtennis.com. July 21 -- California Dream vs. Springfield, Sunrise Mall in Citrus Heights, 7:30 p.m., www.californiadreamtennis.com. July 23 -- California Dream (with Bob and Mike Bryan) vs. San Diego, Sunrise Mall in Citrus Heights, 7:30 p.m., www.californiadreamtennis.com. Oct. 25-Nov. 1 -- WTA Finals, Singapore. 2014 champions: Serena Williams, Cara Black/Sania Mirza. wtafinals.com. Division I Singles Championships, May 20-25 in Waco, Texas. Cal will send four women and Stanford three to the NCAA Division I Singles Championships on May 20-25 in Waco, Texas. However, Bears junior Lynn Chi, last year's runner-up, was bypassed. One man from each school will go to the tournament. The NCAA today selected the 64 singles players and 32 doubles teams for both the men's and women's championships, which will follow the May 14-19 team tournaments in Waco. Cal sophomore Maegan Manasse is seeded fourth in women's singles. Joining the third-ranked Manasse (36-7) from the No. 3 Bears are No. 25 Klara Fabikova (31-8), No. 41 Szofi Susanyi (31-10) and No. 42 Denise Starr (33-7). Susanyi in 2012 became Cal's first freshman to reach the semifinals. She lost in the round of 16 in 2013 and the second round last year. Carol Zhao leads No. 13 Stanford's contingent of three sophomores. Zhao (24-7), ranked and seeded second behind Robin Anderson of UCLA, is accompanied by No. 17 Taylor Davidson (27-8) and No. 27 Caroline Doyle (27-5), a San Francisco resident. USC's Giuliana Olmos, a junior from Fremont, is seeded 9-16. Sophie Watts, the Mountain West Conference Player of the Year, received an automatic berth. Earning men's berths were Cal sophomore Andre Goransson (25-9), ranked 29th, and Stanford 6-foot-6 (1.98-meter) freshman Tom Fawcett (26-9), ranked 30th. UCLA's Mackenzie McDonald (28-4), a sophomore from Piedmont, is seeded third. Stanford and Cal have two teams each in women's doubles, and all but one are seeded. Davidson and Zhao (29-6) are No. 2. Fabikova-Susanyi (31-6) and Manasse-Starr (29-8) are each No. 5-8. Stanford's Doyle and Ellen Tsay (25-8) are unseeded, as are USC's Olmos and Zoe Scandalis (15-7). Stanford's John Morrissey and Robert Stineman (14-3) and UCLA's Mackenzie and Martin Redlicki (18-6) are unseeded in men's doubles. Eric Steidlmayer of UC Davis became the first Big West Conference Men's Coach of the Year in program history on Tuesday. In his third year as the Aggies' coach, Steidlmayer guided the team to a 16-6 record and share of the Big West regular-season title. The 16 wins set the program's Division I record, surpassing the previous mark of 14 last season. UC Davis also returned to the national rankings for the first time in seven seasons, climbing to a program-best No. 53 on April 14. The Aggies are now No. 57. UC Davis earned its highest seeding in the Big West tournament at No. 2 but fell to No. 3 UC Santa Barbara in the semifinals. The Gauchos went on to win the title. Two Aggies, sophomores Alec Adamson (Corona del Mar) and James Wade (San Marino), were named to the All-Big West first team. Earning second-team honors in doubles were Adamson with junior Adam Levie (Solana Beach) and sophomore Bryce McKelvie (San Jose) with junior Brett Bacharach (Newcastle in the Sacramento area). Wade and freshman Tommy Lam (Hong Kong) received honorable mention in doubles. UC Davis freshman Kristy Jorgensen of San Carlos was named to the women's second team in singles and doubles (with senior Layla Sanders of El Cerrito). The Aggies finished 11-12. UC Irvine's Kat Facey, a senior from Cameron Park in the Sacramento area, was selected to the women's first team in singles and doubles (with her twin sister, Ali). The Cal and Stanford women will host first-round matches in the NCAA Team Championships, while their male counterparts will go on the road. The Saint Mary's women, the only other Northern California team in the championships, also will travel. The NCAA announced the brackets for the 64-team tournaments on Tuesday. The third-seeded Cal women (20-3) will put their eight-match winning streak on the line against Bryant (8-8) of Smithfield, R.I., on May 8 at 1 p.m. at the Hellman Tennis Complex. That will follow the 10 a.m. match between Houston (22-5) and Mississippi State (15-11). The winners will meet on May 9 at noon at Hellman. The 14th-seeded Stanford women (15-5) will face Stony Brook (15-1) on May 8 at 2 p.m. at the Taube Family Tennis Stadium after the 11 a.m. encounter between Pepperdine (17-6) and Auburn (16-13). The survivors will battle on May 9 at 1 p.m. at Taube. The Saint Mary's women (14-9) will take on Northwestern (15-7) on May 9 at UCLA. The winner almost certainly will face the host Bruins (18-4), the defending national champions, on May 10. The Cal men (18-8) will play Texas A&M-Corpus Christi (19-6) on May 8 in Austin, Texas. The winner probably will face ninth seed and host Texas (19-6) on May 9. The Stanford men (17-6), enjoying a resurgence under first-year coach Paul Goldstein, will take on Tennessee (14-12) on May 8 in Durham, N.C. The survivor likely will meet 10th seed and host Duke (22-6) on May 9. The last four rounds of the NCAA Team Championships are set for May 14-19 in Waco, Texas. The men's and women's fields for the NCAA Singles and Doubles Championships, May 20-25 in Waco, will be released today. SACRAMENTO -- Amit Batta has talked to the coaches at UC Davis and UC Santa Barbara and likes both schools. But the 16-year-old Los Altos resident has bigger aspirations. "My dream school is UCLA or Texas," Batta said Sunday after winning the boys 18 title at the Rio Del Oro Junior Excellence tournament at the Rio Del Oro Racquet Club. "I've always liked the combination of athletics and education, and I love their athletics and education. "Also, they're in great locations. Austin is a great city, and UCLA is in a nice part of Los Angeles. I have a ton of friends at UCLA." What about Stanford, just a lob away from Los Altos, or Cal across San Francisco Bay? "I'm very interested in them," conceded Batta, who lived in his parents' native India from age 10 to 15. "I'm hoping they reach out. I'm going to stop e-mailing them. I want them to want me." Batta does have one concern, though. "My friends say Cal is overcrowded," he said. Batta, seeded second in the Rio Del Oro tournament, beat top-seeded Ajai Shekhera of Campbell 2-6, 6-3, 6-2 for the crown. In the girls 18 final, fourth-seeded Rachel Eason, 15, of Union City topped fifth-seeded Jessi Muljat, 14, of Sacramento 6-2, 6-4. Meanwhile, two tiny girls with immense talent, also playing up, breezed to titles. Third-seeded Katie Volynets, 13, of Walnut Creek overwhelmed unseeded Payton Saca of Sacramento, 6-0, 6-0 in the 16s. And top-seeded Connie Ma, 11, of Dublin, dominated unseeded Monica Stratakos of Saratoga 6-2, 6-1 in the 14s. Volynets, last year's USTA girls 12 national champion, is 4-foot-11 (1.5 meters) and 73 pounds (33.1 kilograms). Ma is 4-9 (1.45 meters) and 70 pounds (31.8 kilograms). Saca, who's 7 1/2 inches (19 centimeters) taller and 37 pounds (16.8 kilograms) heavier than Volynets, moderately praised her opponent. "She's a good player when she hits the ball in her strike zone," offered Saca, who's also 13 but 6 1/2 months older than Volynets. "She's very competitive. She doesn't give up." Boys 18 -- Amit Batta (2), Los Altos, def. Ajai Shekhera (1), Campbell, 2-6, 6-3, 6-2. Boys 16 -- Daly Meinert (1), Fresno, def. Andre Xiao (3), Saratoga, 6-3, 6-0. Boys 14 -- Aditya Gupta (1), Los Altos, def. Stefan Leustian (2), Mather, 7-6 (10), 5-7, 3-1, ret. Boys 12 -- Anas Abdelouahid (2), San Jose, def. Aryan Chaudhary (5), Santa Clara, 4-6, 6-2 [10-5]. Girls 18 -- Rachel Eason (4), Union City, def. Jessi Muljat (5), Sacramento, 6-2, 6-4. Girls 16 -- Katie Volynets (3), Walnut Creek, def. Payton Saca, Sacramento, 6-0, 6-0. Girls 14 -- Connie Ma (1), Dublin, def. Monica Stratakos, Saratoga, 6-2, 6-1. Girls 12 -- Vivian Ovrootsky (2), San Jose, def. Claire Galerkin (1), San Francisco, 5-2, ret. Boys 18 -- Donald Hall, Chico, and Max Yun (1), Walnut Creek, def. Amit Batta, Los Altos, and Ajai Shekhera, Campbell, 8-5. Boys 16 -- Daly Meinert, Fresno, and Andre Xiao (1), Saratoga, def. Kailas Shekar, Saratoga, and Dean Stratakos (4), Saratoga, 8-5. Boys 14 -- Stefan Leustian, Mather, and Zachery Lim (2), Fairfield, def. Aidan Mayo, Roseville, and Coby McCaig (4), Modesto, 9-8 (6). Boys 12 -- Aryan Chaudhary, Santa Clara, and Jake Vassel (1), Danville, def. Max Fardanesh, Albany, and Geoffrey Golan (2), San Jose, 8-4. Girls 18 -- Sara Choy, Palo Alto, and Catalina Rico (1), San Jose, def. Sarah Hu, Oakland, and Katya Tabachnik (2), San Francisco, 8-3. Girls 16 -- Hind Abdelouahid, San Jose, and Abbie Mulbarger (1), Woodbridge, def. Jacquie Tan (2), Elk Grove, and Jessica Tsukigi (2), San Jose, 8-6. Girls 14 -- Katherine Duong, Cupertino, and Connie Ma, Dublin, def. India Houghton, Tiburon, and Alena Pruett (4), Mountain View, 8-6. Girls 12 --Claire Galerkin, San Francisco, and Maryia Lucia, Roseville, def. Alisha Chulani, Los Altos, and Katherine Simone, Morgan Hill, 8-6. Klara Fabikova lost a set 6-0 for the first time this season on Sunday. But the Cal junior, who lost to UCLA's Catherine Harrison 6-4, 6-0 in the final of the Pac-12 Championships in Ojai, shouldn't feel too bad. Harrison demolished Utah's Tereza Bekerova 6-0, 6-0 in the quarterfinals. Harrison, unseeded and ranked 67th, did not lose a set in her five matches, including a walkover in the semifinals. Fabikova, seeded fourth and ranked 25th, was trying to win Cal's first conference singles title since 2006. “When I started I didn’t feel as comfortable on the court as (Saturday),” Fabikova (31-8), from the Czech Republic, said on calbears.com of her semifinal win over top-seeded and 18th-ranked Giuliana Olmos of USC. “I felt this pressure right away. I was up 2-0 at one point, but I didn’t really feel like myself today. None of the top three women in the country -- No. 1 Robin Anderson of UCLA, No. 2 Carol Zhao of Stanford or No. 3 Maegan Manasse of Cal -- played singles in the Pac-12 Championships. Nor did No. 17 Taylor Davidson of Stanford. In an all-Stanford doubles final, top-seeded Davidson and Zhao beat fourth-seeded Caroline Doyle and Ellen Tsay 7-5, 6-2. Anderson didn't play doubles, either. Big Sky Conference Championships in Gold River -- The Sacramento State women's streak of 13 tournament titles ended with a 4-3 loss to Idaho at the Gold River Racquet Club in the Sacramento area. At 3-3, Lucia Badillos defeated Olivia Boija 3-6, 7-5, 6-3 at the No. 6 spot. Boija led 5-1 in the second set. Sac State (17-11) was seeded first and Idaho (15-8) second. Idaho swept the titles in its first year in the Big Sky. The second-seeded men topped sixth-seeded Northern Arizona 4-2. The Stanford men twice were on the verge of winning the Pac-12 Championships but couldn't prevail. Leading 3-2, the 26th-ranked Cardinal dropped the last two matches to No. 8 USC on Saturday in Ojai. No. 67 Nick Crystal got the Trojans, coming off their fifth NCAA team title in six years, even with a 7-6 (tiebreaker score not available), 6-4 victory over Maciek Romanwicz on Court 6. In the deciding match on Court 2, No. 100 Eric Johnson defeated No. 69 John Morrissey 6-4, 4-6, 6-2. USC (22-4) earned an automatic bid to the NCAA Tournament, which begins on May 8 at sites around the country. Stanford (17-6) likely will receive an at-large berth when the field is announced on Tuesday. In the women's (individual) tournament, fourth-seeded Klara Fabikova of Cal routed top-seeded Giuliana Olmos of USC 6-1, 6-2 to reach the final. Olmos, a junior, is from Fremont in the San Francisco Bay Area. Fabikova, a junior from the Czech Republic, will meet unseeded Catherine Harrison of UCLA. Harrison advanced when Zoe Scandalis of USC pulled out with an undisclosed injury. None of the top three women in the country -- No. 1 Robin Anderson of UCLA, No. 2 Carol Zhao of Stanford or No. 3 Maegan Manasse of Cal -- played singles. Nor did No. 17 Taylor Davidson of Stanford. Anderson didn't play doubles, either. In an all-Stanford doubles final, top-seeded Davidson and Zhao will play fourth-seeded Caroline Doyle and Ellen Tsay. Mountain West Conference Championships in Albuquerque, N.M. -- Top-seeded Fresno State and third-seeded San Jose State lost heartbreakers in the women's semifinals. The Bulldogs fell to fifth-seeded Wyoming 4-3, and the Spartans succumbed to second-seeded New Mexico by the same score. Fresno State trailed 3-0, but Sophie Watts, the Mountain West Player of the Year, saved two match points on Court 1 and pulled the Bulldogs even at 3-3. Then Wyoming's Silviya Zhelyazkova edged Anne Susdorf 4-6, 7-5, 7-6 (3) on Court 6. Susdorf had two match points serving at 6-5 in the third set. San Jose State squandered a 3-1 lead. In the deciding match, Sharon Coone topped Abbie Pahz 3-6, 6-1, 6-1 on Court 6. Big Sky Conference Championships in Gold River -- The top-seeded Sacramento State women trounced fourth-seeded Northern Arizona 4-0 to reach the final at the Gold River Racquet Club in the Sacramento region. The Hornets (17-10), seeking their 14th consecutive Big Sky tournament title, will face No. 2 Idaho today at 2 p.m. Admission is free. The Vandals outclassed No. 3 Montana 4-1. The Stanford men avenged a loss to archrival Cal and reached the final of the Pac-12 Championships. The Cardinal, seeded first and ranked 26th, routed the Bears, seeded fourth and ranked 25th, 4-1 on Friday in Ojai. Cal had beaten host Stanford 4-3 six days earlier to end the Cardinal's winning streak at 10 matches and relegate Stanford to a share of the conference title with USC. Stanford (17-5) will meet USC (21-4), seeded second and ranked eighth, today at 5 p.m. for the Pac-12 title. The teams split their two regular-season matches. The Trojans are coming off their fifth NCAA team title in six years. In the women's individual tournament, fourth-seeded Klara Fabikova of Cal trounced Jennifer Brady of UCLA 6-0, 6-1 to reach the semifinals. Brady, who won the $25,000 Redding Challenger last September, is ranked No. 208 in the world. Fabikova, a junior from the Czech Republic, will play top-seeded Giuliana Olmos of USC today at 10:30 a.m. Olmos, a junior from Fremont in the San Francisco Bay Area, topped sixth-seeded Desirae Krawczyk of Arizona State 3-6, 6-3, 6-2. In the other semifinal, Zoe Scandalis of USC will face Catherine Harrison of UCLA at 10:30 a.m. The doubles semifinals feature two Stanford-Cal matchups. Top-seeded Davidson and Zhao will play third-seeded Manasse and Denise Starr, and second-seeded Fabikova and Zsofi Susanyi will battle fourth-seeded Caroline Doyle and Ellen Tsay of Stanford. Big Sky Conference Championships in Gold River -- The fifth-seeded Sacramento State men suffered a heartbreaking 4-3 loss to fourth-seeded Montana State in the quarterfinals at the Gold River Racquet Club in the Sacramento area. With the score tied 3-3, Niklas Brandes edged Sean Kolar 3-6, 7-6, 7-6 (tiebreaker scores not available). The top-seeded Sac State women, who received a first-round bye, are scheduled to play fourth-seeded Northern Arizona in the semifinals today at 2 p.m.
West Coast Conference Championships in San Diego -- All four semifinal teams from Northern California lost in the men's and women's tournaments. In the men's bracket, second-seeded Pepperdine dominated third-seeded USF 4-1, and top-seeded San Diego overwhelmed fourth-seeded Pacific 4-0. On the women's side, second-seeded Portland hammered third-seeded USF 4-0, and top-seeded Pepperdine whipped fourth-seeded Saint Mary's 4-0. Big West Conference Championships in Indian Wells -- The UC Davis men and women were eliminated. The second-seeded men lost to third-seeded UC Santa Barbara 4-1 in the semifinals, and the sixth-seeded women fell to third-seeded UCSB 4-0 in the quarterfinals. Mountain West Conference Championships in Albuquerque, N.M. -- Top-seeded Fresno State women and third-seeded San Jose State easily advanced to the women's semifinals. The Bulldogs will meet fifth-seeded Wyoming, and the Spartans will take on second-seeded New Mexico. The 25th-ranked Cal men battled back numerous times and narrowly averted an upset loss to No. 50 Oregon in the quarterfinals of the Pac-12 Championships in Ojai. Gregory Bayane defeated Simon Stevens 4-6, 7-6 (2), 6-4 on Court 3 on Thursday to give the fourth-seeded Bears (18-7) a 4-3 victory over the fifth-seeded Ducks (15-9). “We knew going into this that Oregon would be a tough match today,” Cal coach Peter Wright said on calbears.com. “Unfortunately, we dug ourselves quite a hole today by losing the doubles point and the first set in four of the singles matches. We were down match points at No. 4 singles, and Oregon served for the match at No. 3. Archrivals will meet in both of today's semifinals. Cal will face top-seeded and 26th-ranked Stanford at noon, and second-seeded USC will play third-seeded UCLA at 3 p.m. The Trojans are coming off their fifth NCAA team title in six years. Mackenzie McDonald, a sophomore from Piedmont in the San Francisco Bay Area, plays No. 1 singles and doubles for the Bruins. In women's singles, top-seeded Giuliana Olmos of USC and fourth-seeded Klara Fabikova of Cal each won two straight-set matches to reach the quarterfinals. Olmos, a junior from Fremont in the Bay Area, will take on Nia Rose of Oregon. Fabikova, a junior from the Czech Republic, will go against UCLA's Jennifer Brady, the reigning champion of the $25,000 Redding Challenger who's ranked No. 208 in the world. None of the top three players in the country -- No. 1 Robin Anderson of UCLA, No. 2 Carol Zhao of Stanford or No. 3 Maegan Manasse of Cal -- is playing singles. Nor is No. 17 Taylor Davidson of Stanford. Davidson and Zhao are seeded first in doubles, which begins today, and ranked second nationally. Manasse and Denise Starr are seeded third and ranked eighth. Anderson isn't playing doubles, either. West Coast Championships in San Diego -- The third-seeded USF men and fourth-seeded coasted into the semifinals. The Dons will play No. 2 Pepperdine, and the Tigers will face No. 1 San Diego. In the women's tournament, third-seeded USF and fourth-seeded Saint Mary's advanced to the semis with 4-0 victories. The Dons will meet No. 2 Portland, and the Gaels will battle No. 1 Pepperdine. Mountain West Championships in Albuquerque, N.M. -- The fifth-seeded Boise State men whipped fourth-seeded Fresno State 4-0 in the quarterfinals. On the women's side, top-seeded Fresno State and third-seeded San Jose State will play today in the quarterfinals. The Bulldogs are led by Mountain West Player of the Year Sophie Watts, a junior from England. Fresno State's Sophie Watts was named the Women's Player of the Year in the Mountain West Conference this week. Watts, a junior from England, is ranked 75th nationally. She is 21-2 in singles with a 21-match winning streak. Watts' teammate, Maiar Sherif Ahmed, was chosen as the Freshman of the Year. Ahmed, from Egypt, is 20-3 in singles. Singles -- Sophie Watts, Fresno State; Maiar Sherif Ahmed, Fresno State; Rana Sherif Ahmed, Fresno State; Sybille Gauvain, San Jose State; Marie Klocker, San Jose State. Singles -- Euan McIntosh, Fresno State. First-team singles -- Miguel Diaz, Pacific; Bernardo Saraiva, USF. Second-team singles -- Ashot Khacharyan, Santa Clara; Ilya Osintsev, Santa Clara. Singles honorable mention -- Jose Chamba, Pacific; Arthur Weber, Saint Mary's; Nils Skajaa, USF; Thomas Takemoto, USF. First-team doubles -- Bernardo Saraiva and Nils Skajaa, USF. Second-team doubles -- Sam Bertram and Ilya Osintsev, Santa Clara; Mikheil Khmiadashvili and Ashot Khacharyan, Santa Clara. Doubles honorable mention -- Miguel Diaz and Jose Chamba, Pacific; Marlon Brand and Daniel Alameh, Pacific. First-team singles -- Andrea Ka, USF. Second-team singles -- Hana Ritterova, Pacific; Danielle Flores, Saint Mary's; Thyra Taune, USF; Delphine Rouvillois, Santa Clara. Singles honorable mention -- Iveta Masarova, Pacific; Jana McCord, Saint Mary's; Jamie Pawid, Saint Mary's; Kareena Manji, Saint Mary's; Millica Hadzi-Tanovic, USF. First-team doubles -- Andrea Ka and Marina Nikolic, USF. Second-team doubles -- Kareena Manji and Jamie Pawid, Saint Mary's; Parminder Kaur and Jana McCord, Saint Mary's; Iveta Masarova and Hana Ritterova, Pacific. Doubles honorable mention -- Nabila Farah and Daniella Silva, Santa Clara. All four Northern California teams in action today lost in the first round of the West Coast Conference Championships in San Diego. The seventh-seeded Santa Clara women (7-12) dropped a heartbreaker, 4-3 to 10th-seeded Loyola Marymount (5-19). With the overall match tied 3-3, Anna Romeka outlasted Danielle Silva 2-6, 6-3, 6-3 at the No. 3 position. Also, the ninth-seeded San Diego women (4-14) triumphed 4-2 against eighth-seeded Pacific (8-13). On the men's side, seventh-seeded BYU (10-17) rolled to a 4-1 victory over Saint Mary's (4-18), and ninth-seeded Gonzaga (11-10) romped 4-0 against eighth-seeded Santa Clara (9-13). It was the Bulldogs' first win in the WCC Championships since 2008. In Thursday's quarterfinals, the third-seeded USF women will face sixth-seeded Gonzaga, the fourth-seeded Saint Mary's women will take on fifth-seeded BYU, and the fourth-seeded Pacific men will meet fifth-seeded Portland. The top six seeds in both the men's and women's draws received first-round byes. Dennis Novikov and Tennys Sandgren, both of whom have Northern California ties, played doubles together last week and soared in the world rankings. Novikov, who lives in San Jose, and Sandgren, who is scheduled to play for the Sacramento-based California Dream in World TeamTennis in July, reached the semifinals of the $100,000 Sarasota Challlenger on clay. Novikov, 21, jumped 55 places to a career-high No. 287 in doubles. Sandgren, 23, of Wesley Chapel, Fla., improved 43 spots to No. 269. Sandgren climbed to a career-high No. 115 in doubles in January 2014 but then underwent hip surgery and missed more than six months. In the 2012 Sacramento Challenger, he won the doubles title with former University of Tennessee teammate Rhyne Williams and reached the singles quarterfinals. Sandgren, by the way, is not named after tennis. He has Swedish heritage, and Tennys was his great-grandfather's name. And, no, Sandgren's ancestor did not play tennis. Collin Altamirano, 19-year-old Sacramentan -- No. 883 in singles (+1). Bradley Klahn, 24-year-old former Stanford star -- No. 229 in singles (-1), No. 148 in doubles (+3). Scott Lipsky, 33-year-old former Stanford star -- No. 34 in doubles (+1), unranked in singles. Mackenzie McDonald, 20-year-old Piedmont resident -- No. 536 in singles (-3), No. 559 in doubles (-6). Dennis Novikov, 21-year-old San Jose resident -- Career-high No. 190 in singles (+4), career-high No. 287 in doubles (+55). Aisam-ul-Haq Qureshi, 35-year-old member of Sacramento-based California Dream in World Team Tennis (2015) -- No. 50 in doubles (-4). Sam Querrey, 27-year-old San Francisco native and former Sacramento Capital in World TeamTennis (2012-13) -- No. 38 in singles (+3), No. 60 in doubles (+1). Tennys Sandgren, 23-year-old member of California Dream -- No. 269 in doubles (+43), No. 463 in singles (no change). Matt Seeberger, 30-year-old Los Altos resident -- Career-high No. 297 in doubles (+3). Dmitry Tursunov, 32-year-old resident of Folsom in Sacramento area -- No. 197 in singles (-21), No. 323 in doubles (+3). Kristie Ahn, 22-year-old former Stanford star -- No. 534 in singles (-2), No. 605 in doubles (+2). CiCi Bellis, 16-year-old resident of Atherton in San Francisco Bay Area -- No. 173 in singles (+1). Alexandra Facey, 22-year-old resident of Cameron Park in Sacramento area -- No. 727 in doubles (-3). Kat Facey, 22-year-old resident of Cameron Park in Sacramento area -- No. 727 in doubles (-3). Jarmila Gajdosova, 27-year-old member of California Dream (2015) -- No. 49 in singles (-1), No. 54 in doubles (-1). Anabel Medina Garrigues, 32-year-old member of California Dream (2015) -- No. 34 (no change) in doubles, No. 526 (no change) in singles. Nicole Gibbs, 22-year-old former Stanford star -- No. 96 in singles (+4), No. 991 in doubles (-5). Michaela Gordon, 15-year-old resident of Saratoga in San Francisco Bay Area -- No. 749 in singles (+1). Lejla Hodzic, 29-year-old former Stanford standout -- No. 751 in doubles (no change). Raquel Kops-Jones, 32-year-old San Jose resident and former Cal star -- No. 13 in doubles (no change), No. 794 in singles (-2). Maria Sanchez, 25-year-old Modesto product -- No. 106 in doubles (no change), No. 183 in singles (-3). Allie Will, 24-year-old native of San Mateo in San Francisco Bay Area -- No. 217 in doubles (-6), No. 575 in singles (-12). Carol Zhao, 19-year-old Stanford sophomore -- No. 290 in singles (+1), No. 505 in doubles (+1). Barcelona and Stuttgart (men/women), early rounds, 3 a.m.-1:30 p.m. (live). Stuttgart (women), early rounds, 2-7 p.m. and 10:30 p.m.-12:30 a.m. Friday (repeat). Barcelona (men), early rounds, 7-10:30 p.m. (repeat). Barcelona and Stuttgart (men/women), quarterfinals, 3 a.m.-1:30 p.m. (live). Stuttgart (women), quarterfinals, 2-7 p.m. and 10:30 p.m.-12:30 a.m. Friday (repeat). Barcelona (men), quarterfinals, 7-10:30 p.m. (repeat). Barcelona and Stuttgart (men/women), semifinals, 4:30-11:30 a.m. (live). Stuttgart (women), semifinals, 3-7 p.m. and 9:30-11:30 p.m. (repeat). Barcelona (men), semifinals, 7-9:30 p.m. (repeat). Barcelona and Stuttgart (men/women), finals, 5:30-11 a.m. (live). Stuttgart (women), final, 11:30 a.m.-1 p.m. and 5-7 p.m. (repeat). Bucharest (men), final, 3-5 p.m. (delay). Barcelona (men), final, 7-9 p.m. (repeat). Today-Saturday -- West Coast Conference Men's and Women's Championships, San Diego, www.wccsports.com. Today-Sunday -- Pacific-12 Conference Men's and Women's Championships, Ojai, Calif., www.pac-12.com. Today-Sunday -- Mountain West Conference Men's and Women's Championships, Albuquerque, N.M, www.themw.com. Today-Sunday -- Big West Conference Men's and Women's Championships, Indian Wells. www.bigwest.org. Friday-Sunday -- Big Sky Conference Men's and Women's Championships, Gold River Racquet Club, Gold River, Calif., www.bigskyconf.com. The Cal women rose one spot in this week's national rankings to No. 3 after beating rival Stanford 5-2 in Berkeley on Saturday. The Bears (20-3, 9-1) will take an eight-match winning streak into the Pac-12 Championships, Thursday through Sunday in Ojai. Cal is led by third-ranked Maegan Manasse, a sophomore from Redondo Beach in the Los Angeles area. Stanford (15-5, 7-3) fell two notches to No. 13. The next rankings will be released on May 1. The No. 53 UC Davis men lost their regular-season finale but claimed a share of the Big West Conference title. UC Irvine routed the Aggies 6-1 in Irvine on Sunday to move into a tie for first place at 4-1. UC Davis' victory came from Jesse Ross, a 6-foot-5 (1.96-meter) sophomore from Ojai, at No. 6. UC Irvine (19-12 overall) will be seeded first in the Big West Conference tournament, Thursday through Sunday at Indian Wells. Both the Anteaters and Aggies will receive first-round byes. UC Davis (16-5), whose No. 2 seeding is the highest in school history, will meet the winner of No. 3 UC Santa Barbara and No. 6 Hawaii in the semifinals on Friday at 3 p.m.
Santa Clara def. No. 67 Portland 4-3 in Santa Clara. Records: Santa Clara 9-12 overall, 3-6 West Coast Conference, Portland 12-7, 5-4. No. 61 Portland def. Santa Clara 6-1 in Portland, Ore. Records: Portland 15-5 overall, 7-2 WCC; Santa Clara 7-11, 3-6. Because of freshman Billy Griffith of Fresno, the No. 24 Stanford men had to settle for a share of the Pacific-12 Conference title. Griffith pulled out a 3-6, 7-6 (5), 6-4 victory over Nolan Paige at the No. 5 spot, giving No. 28 Cal a 4-3 win over the host Cardinal on Saturday. The Bears (17-7, 5-2 Pac-12) ended Stanford's winning streak at 10 matches, but the Cardinal (16-5, 6-1) earned a share of the conference title with USC. It's Stanford's first regular-season league crown since 2010. Stanford will be seeded No. 1 in next week's Pac-12 Championships in Ojai because of its 4-3 upset of USC last week at Stanford. The Trojans defeated Stanford in a nonconference match in Los Angeles earlier in the season. No. 40 Pepperdine def. Saint Mary's 4-0 in Malibu. Records: Pepperdine 15-8 overall, 7-2 West Coast Conference; Saint Mary's 4-17, 1-8. No. 53 UC Davis def. UC Riverside 7-0 in Riverside. Aggies clinch share of Big West Conference title. Records: UC Davis 16-4, 4-0; UC Riverside 3-15, 0-4. No. 55 USF def. No. 67 Portland 4-0 in San Francisco. Records: USF 16-8 overall, 6-3 WCC. Portland 12-6, 5-3. Pacific def. No. 75 Loyola Marymount 4-3 in Los Angeles. Records: Pacific 9-16 overall, 6-3 WCC; Loyola Marymount 13-10, 3-6. Santa Clara def. Gonzaga 4-2 in Santa Clara. Records: Santa Clara 8-12 overall, 2-6 WCC; Gonzaga 10-10, 2-7. Fresno State def. Nevada 4-1 in Fresno. Records: 16-9 overall, 4-3 Mountain West Conference; Nevada 7-15, 1-6. No. 4 Cal def. No. 11 Stanford 5-2 in Berkeley. Records: Cal 20-3 overall, 9-1 Pacific-12 Conference; Stanford 15-5, 7-3. No. 45 Saint Mary's def. No. 18 Pepperdine 6-1 in Moraga. Records: Saint Mary's 13-8 overall, 7-2 WCC; Pepperdine 14-6, 8-1. No. 43 Fresno State def. UNLV 4-1 in Las Vegas. Records: Fresno State 17-4 overall, 6-0 MWC (Bulldogs finish regular season undefeated in conference play); UNLV 7-16, 1-4. Washington State def. No. 58 USF 4-3 in Pullman, Wash. Records: Washington State 13-12, USF 12-9. No. 62 San Jose State def. Nevada 5-2 in Reno. Records: San Jose State 13-6 overall, 3-1 MWC; Nevada 8-10, 1-5. UC Davis def. UC Santa Cruz 7-0 in Davis. Records: UC Davis 11-11, UCSC 2-13. Loyola Marymount def. Pacific 4-3 in Stockton. Records: Loyola Marymount 4-19 overall, 1-8 WCC; Pacific 8-12, 2-7. Gonzaga def. Santa Clara 5-2 in Spokane, Wash. Records: Gonzaga 12-8 overall, 3-6 WCC; Santa Clara 7-10, 3-5. No. 40 Pepperdine def. Pacific 4-0 in Malibu. Records: 14-8 overall, 6-2 WCC; Pacific 8-16, 5-3. No. 55 USF def. Gonzaga 4-0 in San Francisco. Records: USF 15-8 overall, 5-3 WCC; Gonzaga 10-9, 2-6. No. 75 Loyola Marymount def. Saint Mary's 5-0 in Los Angeles. Records: Loyola Marymount 13-9 overall, 3-5 WCC; Saint Mary's 4-16, 1-7. No. 4 Cal def. Sacramento State 7-0 in Berkeley. Records: Cal 19-3, Sac State 16-10. No. 18 Pepperdine def. Pacific 4-1 in Stockton. Records: Pepperdine 14-5 overall, 8-0 WCC; Pacific 8-11, 2-6. No. 58 USF def. Gonzaga 4-3 in Spokane, Wash. Records: USF 12-8 overall, 7-2 WCC; Gonzaga 11-8, 2-6.
against San Diego on July 23 at Sunrise Mall in Citrus Heights. Northern California fans will have only one chance to see the Bryan brothers at home this summer. Bob and Mike Bryan, the No. 1 men's doubles team in the world, will play in just three of the new California Dream's 14 regular-season matches during World TeamTennis' 40th season. The Bryans' lone home match is scheduled for Thursday, July 23, at 7:30 p.m. against San Diego at Sunrise Mall in the Sacramento suburb of Citrus Heights. They also are set to play at Boston on July 25 and Philadelphia on July 26. The Bryan twins, who will turn 37 on April 29, have won a record 16 Grand Slam singles titles. The Sacramento area will return to WTT after a one-year absence. The Dream, which replaces the defunct Sacramento Capitals, will play its inaugural match on July 12 at San Diego. Playing full-time for California will be Aisam Qureshi of Pakistan, Tennys Sandgren of Wesley Chapel, Fla., Jarmila Gajdosova of Australia and Anabel Medina Garrigues of Spain. For more information, visit www.californiadreamtennis.com. Thursday, July 30 -- Western Conference Championship at top seed, Eastern Conference Championship at top seed. Sunday, Aug. 2 -- WTT Finals, Western Conference champion at Eastern Conference champion, 8 a.m. (PDT). No. 45 Saint Mary's def. Loyola Marymount 6-1 in Moraga. Records: Saint Mary's 12-8, 6-2 West Coast Conference; Loyola Marymount 3-19, 0-9. Santa Clara def. Sacramento State 4-3 in Santa Clara. Records: Santa Clara 7-12, Sac State 10-13. The Stanford men reached the Top 25 in the nation for the first time this season, according to the new rankings released today. The Cardinal (15-4, 6-0 Pacific-12 Conference) rose 12 spots to No. 24 after upsetting UCLA and defending NCAA champion USC -- then ranked 15th and fifth, respectively -- last weekend at Stanford. Stanford swept its Southern California rivals for the first time since 2009 to extend its winning streak to nine matches. The Cardinal made it 10 straight today with a 4-2 victory at home over No. 55 USF today. Meanwhile, the UC Davis men (15-4, 3-0 Big West Conference) improved 15 places to No. 53 after defeating Cal Poly and No. 65 UC Santa Barbara in Davis. The Aggies had never beaten the Gauchos. On the women's side, Cal dropped one notch to No. 4, and Stanford rose two places to No. 11. Two of the top three players in women's singles are from Stanford or Cal. The Cardinal's Carol Zhao, a senior from Canada, is second, and the Bears' Maegan Manasse, a sophomore from Los Angeles suburb of Redondo Beach, is third. Other college matches -- The Sacramento State women won the Big Sky Conference regular-season title, drubbing Weber State 6-1 at the Rio Del Oro Racquet Club in Sacramento. The Hornets (16-9, 11-0), who completed their 13th undefeated conference season since joining the Big Sky in 1997, will be seeded first in the Big Sky tournament, April 24-26 at the Gold River Racquet Club in the Sacramento area. Weber State fell to 11-6 overall and 6-3 in the Big Sky. On Monday, the Fresno State men edged No. 65 UC Santa Barbara 4-3 in Fresno. The Bulldogs improved to 15-9, and the Gauchos dropped to 11-9. From the pros to the colleges to the juniors, Northern Californians endured a rough Sunday. But in each case, there was a bright side. San Francisco native Sam Querrey lost in the final of the U.S. Men's Clay Court Championships, Sacramento's Collin Altamirano suffered his first collegiate singles loss, and Roseville's Sam Riffice fell in the boys 18 final at the Easter Bowl. Querrey and Riffice can take consolation in having reached the finals (Riffice also lost in Saturday's doubles final). And No. 4 Virginia, where Altamirano is a freshman, pounded No. 28 Louisville 6-1 to clinch its 12th consecutive Atlantic Coast Conference title and extend its winning streak to nine matches. Unseeded Jack Sock defeated the eighth-seeded Querrey 7-6 (9), 7-6 (2) in Houston for his first ATP World Tour singles title. The 22-year-old Sock has four career doubles crowns, including Wimbledon last year with Vasek Pospisil of Canada. Sock saved three set points in the first tiebreaker against Querrey. It was the first all-American final since Mardy Fish beat John Isner in Atlanta in 2011. Sock was playing in only his third tournament of the year after undergoing surgery for a torn muscle in his hip in December. In Charlottesville, Va., eighth-ranked Sebastian Stiefelmeyer of Louisville nipped No. 72 Altamirano 3-6, 6-3 [10-5] at the No. 1 position. Altamirano, the USTA boys 18 national champion in 2013 and runner-up last year, fell to 15-1 in singles. Virginia has won 134 consecutive conference matches (regular season and tournaments), the longest streak in ACC history in any sport. In Indian Wells, top-seeded Taylor Fritz of Rancho Santa Fe in the San Diego area dismantled the 14th-seeded Riffice 6-2, 6-3. Fritz, the fourth-ranked junior in the world, will turn 18 on Oct. 28. Riffice, who swept the Eddie Herr and Orange Bowl 16s titles in December, celebrated his 16th birthday on March 1. Fresno State def. Boise State 4-3 in Fresno. Records: Fresno State 14-9, 3-3 Mountain West Conference; Boise State 10-15, 3-3. UC Santa Barbara def. Pacific 4-3 in Stockton. Records: UCSB 11-8, Pacific 8-15. No. 3 Cal def. Washington State 7-0 and USF 4-0 in Berkeley. Records: Cal 18-3, 8-1 Pacific-12 Conference; Washington State 12-12, 0-10; USF 11-8. No. 13 Stanford def. No. 16 Pepperdine 6-1 at Stanford. Records: Stanford 15-4, Pepperdine 13-5. No. 39 Fresno State def. No. 73 San Diego State 4-1 in San Diego. Records: Fresno State 15-4, 5-0 Mountain West; San Diego State 11-10, 2-2. No. 56 San Jose State def. Academy of Art 6-1 in San Jose. Records: San Jose State 12-6, Academy of Art 11-4. Only one week after losing to William Blumberg, the 14th-seeded Riffice crushed his second-seeded rival 6-2, 6-0 on Saturday to reach the boys 18 final at the Easter Bowl in Indian Wells. The Easter Bowl, for Americans only, is one of the top junior tournaments in the United States. Riffice, a 16-year-old resident of Roseville in the Sacramento region, had lost to Blumberg, 17, of Greenwich, Conn., 6-4, 7-6 (4) in the round of 16 at the USTA International Spring Championships in Carson in the Los Angeles area. Blumberg, the 11th-ranked junior in the world, went on to win the title. "I tried to be a lot more offensive and dictate off the first point, because last week, he was being a lot more aggressive than I was, and I was running side to side," Riffice, who trains at the USTA center in Boca Raton, Fla., explained on tenniskalamazoo.blogspot.com after ending Blumberg's winning streak at 10 matches. Riffice will play top-seeded Taylor Fritz, 17, of Rancho Santa Fe in the San Diego area for the title. Fritz beat fourth-seeded Nathan Ponwith of Scottsdale, Ariz., 7-6 (5), 6-0. Fritz has beaten Riffice easily in their two lifetime matches but expects a battle. "He's so much better now," Fritz said. "He won Eddie Herr and Orange Bowl (16s) and has a lot more confidence, and he just beat Will. Will's been playing great lately, so it'll be interesting." Another Sacramento-area player, Cameron Klinger of Elk Grove, won the boys 18 doubles crown with Ponwith. The unseeded pair outclassed sixth-seeded Vasil Kirkov of Tampa, Fla., and Riffice 6-2, 6-3. Ponwith and Klinger got together at the last minute, according to tenniskalamazoo, after their original partners decided not to play doubles. The Stanford men appear to be back under first-year coach Paul Goldstein. Thanks to John Morrissey's dramatic victory, the 36th-ranked Cardinal stunned No. 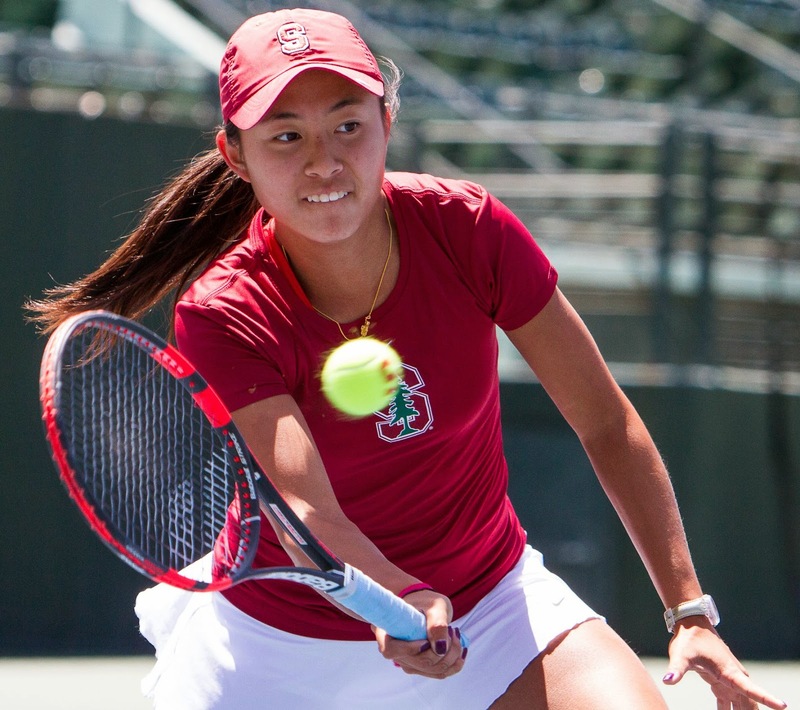 5 USC 4-3 on Saturday at Stanford's Taube Family Tennis Stadium for its ninth straight victory. Morrissey, a senior from Ireland ranked 100th, surprised No. 19 Roberto Quiroz 6-7 (5), 7-6 (2), 6-3 at the No. 2 position in the deciding match after trailing 5-2 in the second set. No. 41 Tom Fawcett, a 6-foot-6 (1.98-meter) freshman from Winnetka, Ill., had given Stanford a 3-2 lead with a 4-6, 6-2, 6-4 victory over No. 6 Yannick Hanfmann on Court 1. Stanford (15-4, 6-0 Pacific-12 Conference) avenged a 6-1 loss to USC (19-4, 5-1) on Feb. 27 in Los Angeles. The Trojans are coming off their fifth NCAA team title in six years. The Cardinal earned its first victory over USC in four years overall and in nine years at home. Stanford also completed its first sweep of USC and UCLA in six years after upsetting the No. 15 Bruins 4-3 on Friday. Stanford clinched at least a share of the Pac-12 title for the first time since 2010. The Cardinal can win its first outright conference crown since 2003 with a victory over No. 27 Cal (16-7, 4-2) next Saturday at Stanford. Stanford has won 17 NCAA men's team titles, second to USC's 21, but none since 2000. The Cardinal has lost in the first round of the NCAA Championships in the past two years. No. 15 UCLA def. No. 27 Cal 4-1 in Berkeley. Records: UCLA 14-7, 5-1 Pac-12; Cal 16-7, 4-2. No. 58 USF def. Saint Mary's 4-1 in San Francisco. Records: USF 12-7, 5-3 West Coast Conference; Saint Mary's 4-15, 1-6. No. 68 UC Davis def. No. 65 UC Santa Barbara 4-3 in Davis. Records: UC Davis 15-4, 3-0 Big West Conference; UCSB 10-8, 2-2. Portland State def. Sacramento State 4-3 in Vancouver, Wash. Records: Portland State 6-11, 3-6 Big Sky Conference; Sac State 10-12, 7-4. Pacific def. Santa Clara 5-2 in Stockton. Records: Pacific 8-14, 5-2 WCC. Santa Clara 6-12, 1-6. No. 13 Stanford def. Washington State 7-0 at Stanford. Records: Stanford 14-4, 7-2 Pac-12; Washington State 12-11, 0-9. USF def. No. 41 Saint Mary's 4-3 in San Francisco. Records: USF 11-7, 6-2 WCC; Saint Mary's 11-8, 5-2. Santa Clara def. Pacific 4-3 in Santa Clara. Records: Santa Clara 7-9, 3-4 WCC; Pacific 8-10, 2-5. UC Davis def. Stanislaus State 7-0 in Davis. Records: UC Davis 10-11, Stanislaus State 4-12. Northern California's singles hopes in the Easter Bowl rest with Sam Riffice. The 14th-seeded Riffice, from Roseville in the Sacramento area, beat No. 10 Mwendwa Mbithi of Deerfield Beach, Fla., 6-1, 7-5 on Friday to reach the boys 18 semifinals at Indian Wells. Unseeded Cameron Klinger, from the Sacramento suburb of Elk Grove, was unable to join Riffice. Klinger lost to top-seeded Taylor Fritz of Rancho Santa Fe in the San Diego area 6-0, 6-7 (5), 6-3 after leading 3-1 with two service breaks in the third set. In today's semis, Riffice will take on second-seeded William Blumberg of Greenwich, Conn., and Fritz will play fourth-seeded Nathan Ponwith of Scottsdale, Ariz. Blumberg topped eight-seeded Catalin Mateas of Braintree, Mass., 7-6 (3), 6-4. Riffice is 0-2 against Blumberg, including a 6-4, 7-6 (4) decision last week in the round of 16 at the USTA International Spring Championships in Carson in the Los Angeles area. The 17-year-old Blumberg, ranked 11th in the world among juniors, went on to win the title. Riffice last December joined Grigor Dimitrov as the only players to sweep the boys 16 singles titles at the Eddie Herr International Championships and the Orange Bowl. The tournaments were held back-to-back in Bradenton, Fla., and Plantation, Fla., respectively. Dimitrov, a 23-year-old Bulgarian and the boyfriend of Maria Sharapova, is the 11th-ranked man in the world after ascending to a career-high No. 8 in August. Riffice, who celebrated his 16th birthday on March 1, trains at the USTA center in Boca Raton, Fla. Meanwhile, Riffice and Klinger will meet in the boys 18 doubles final. Sixth-seeded Vasil Kirkov of Tampa, Fla., and Riffice edged fifth-seeded Trent Bryde of Suwanee, Ga., and Emil Reinberg of Atlanta 7-6 (5), 3-6 [10-8]. Klinger and Ponwith defeated Jake DeVine of Los Altos Hills in the San Francisco Bay Area and 15-year-old Patrick Kypson of Greenville, N.C., 6-4, 6-4.